Speck and provolone bustini: our flagship product for a perfect mix of aromas and flavors of Trentino Alto Adige combined with a smoked top quality provola. 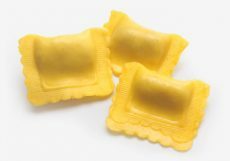 Perfect cooking resistance to involve you in our passion and love for gluten-free fresh pasta. Store chilled at temperature no higher than + 4 ° C.